The 49ers were an historically bad rush defense in 2016. They haven't been quite as bad this year, but they're still the worst run defense in football and have allowed more touchdowns to opposing running backs than any team in the NFL. 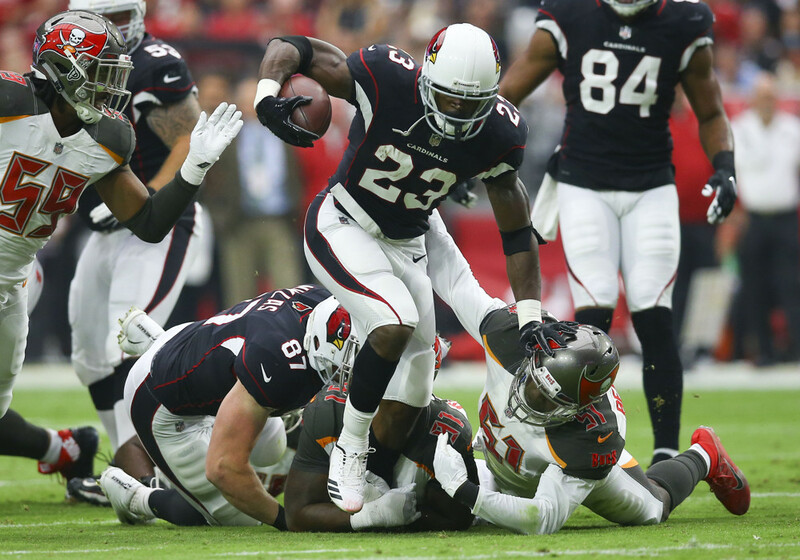 Peterson followed up his first monster game as a Cardinal with a dud, but now he's had a bye week to rest up and learn the offense inside and out so he should be ready to go. San Francisco allows an absurd 32 points per game to opposing running backs in PPR leagues, so Peterson should eat. It's been an incredibly disappointing and frustrating season for DeMarco Murray owners as he's failed to get it going all season. Murray has been banged up since the start of the season, and he, Mariota, and the Titans offense needed last week's bye badly to nurse their injuries. Now they're rested and healthy and face a Ravens defense that's allowed the most rush attempts in the league, and fantasy football is all about opportunity. Baltimore's 952 rush yards are second most in the NFL. This could be one of Murray's biggest games of the season. Jay Ajayi is on the Philadelphia Eagles now, and that means the Dolphins will turn their backfield over to a few young inexperienced backs. Damien Williams is likely to be the passing back, but it looks like Kenyan Drake will be the new starter. Drake has waited for the chance to start for a long time a really long time, considering he was a backup for most of his time at Alabama too. Drake was awesome in limited action last year with 179 yards and two touchdowns on 33 carries, and he had an impressive 6.4 yards per carry in his college career. The Raiders have allowed over 900 rushing yards in just half a season, fourth most in the league. Drake is a must add in every format, and don't be afraid to give him a start Sunday night if you need a running back. Who could have possibly imagined even a month ago that Aaron Jones would be the best Green Bay Packers fantasy play in Week 9? The Packers passing game is broken without Aaron Rodgers, so they'll turn to the run game early and often Monday night against the Lions. Detroit is among the bottom six in running back TDs and points per game allowed, and Jones has put up great numbers since taking on the lead back role. In Green Bay's last game, he saw almost every snap over Ty Montgomery. He could have another big game. Mixon has been getting more and more involved in the Bengals offense and saw a career high snap percentage last week while leading the team in both rushing and receiving yards. Jacksonville has a really stout defense, but their 121 rush yards allowed per game ranks in the bottom five in the league. Cincinnati would do well to keep things moving on the ground, and that means Mixon should see a lot of touches.